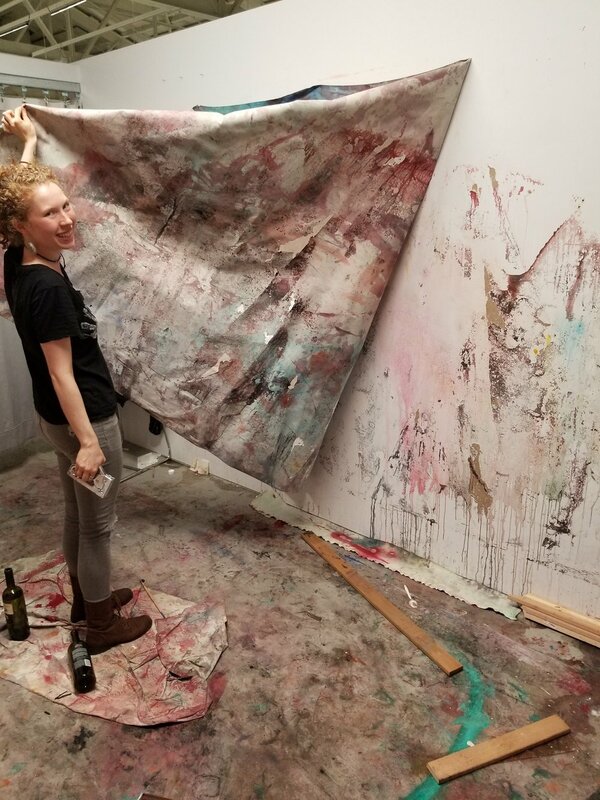 Works coming “from the body” are large-scale abstract paintings made through choreographic movement recorded in color, brush stroke, and composition. In abstraction, I am drawn to conspicuous and mindful voids inspired by my background in mindfulness and religion. Visual spaces impact emotions through color and size, creating moments of quietude and reflection. Works “of the body” are political reflections of social concerns, like violence towards women and food justice. These works, through brutality, examine the gendered space of politics and society through breaking ritual and pushing extremes upon the body. This work begs the question of the radical transformation of beauty into crudeness, inelegance, and raw humanity. Pain morphs into truth through moments of catharsis processed beyond titillation and drama. Anger, joy, and pain engage to broaden an understanding and refinement of the psychosexual, spiritual-political, and psycho-political. It is my aspiration that my work will mobilize socio-political activism through empathy, defy and complicate assumptions of my personhood, and motivate compassion. It is my sentiment that spiritual and political work done conspicuously is endlessly poetic.